Despite being intensely proud of the Council District he represents, Mike Bonin has no illusions that the Westside’s CD11 is a Livable Streets paradise. “Every single North-South street,” he half-joked to me when I asked if there were any streets in the district that could use a road diet. Following the success of the Main Street Road Diet in Venice, there is some excitement of possibly putting other streets on a diet, i.e. removing a mixed use travel lane and replacing it with dedicated bike lanes. While Bonin is enthusiastic about the possibility of bringing more road diets home, he also recognizes that on the Westside, there need to be more ways to move a lot of people north and south. And he doesn’t mean massive highway projects. “I’m not a big fan of the 405 project,” Bonin flatly states of the late, over-budget, 405 widening project that spawned two Carmaggedons and lost the support of even it’s largest backers. In Bonin’s vision, such a rail line wouldn’t just get people over the mountain from the Westside to the Valley or vice-versa, it would also create a rail mass transit option for people within the Westside. When we sat down on the 733 Rapid last week, we didn’t know that Bonin and San Fernando Valley Council Member Paul Krekorian would be appointed to the Metro Board of Directors by Eric Garcetti. Putting a Valley and Westisde Council Member on the powerful board is a clear sign from the Mayor’s Office that advancing the “LAX to the Valley” transit project is high on his priority list. But while a connector between LAX and the Valley is still years in the future, the Expo Line Phase II is being built right through of Bonin’s 11th Council District today. When we spoke last week on the bus, he was on his way to a meeting of the Expo Construction Authority Board of Directors. At that meeting he was voted Vice-Chair of the Board. Vice Chair of the Expo Construction Authority, Member of the Metro Board of Directors, Chair of the City Council Transportation Committee. Mike Bonin has been in office for less than three weeks, and he’s basically positioned himself in the center of the Greater Los Angeles transportation world. 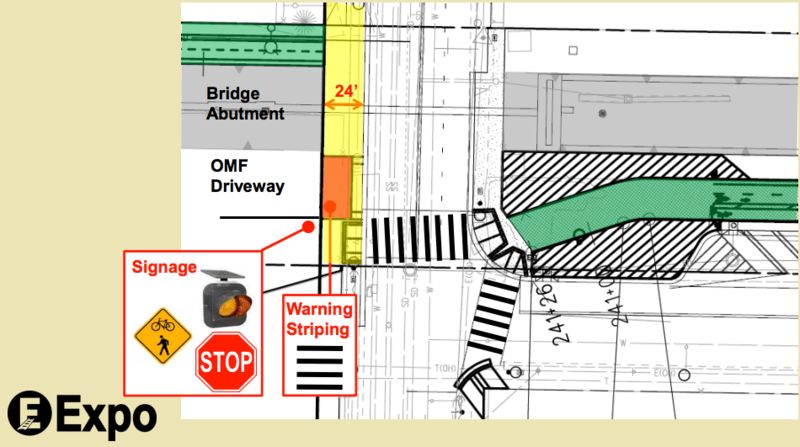 So getting the design fixed for the future bicycle crossing at Exposition and Centinella ought to be a piece of cake, right? “I’m cautiously optimistic,” Bonin remarked. For those of you that missed it, as a result of a compromise between the Expo Construction Authority and local homeowners moved the driveway for an Expo Maintenance facility at the crossing of Exposition and Centinela from its original design. The new plan calls for a driveway to face Centinela instead of Exposition, requiring cyclists on the bike path built adjacent to the railway have to literally bicycle across a driveway. Expo staff and their contractors insist the design is safe. Everyone else that looks at it sees a disaster waiting to happen. Bonin’s predecessor, Bill Rosendahl, introduced and moved a motion asking LADOT to explore funding options for fixing the crossing as Expo bluntly refuses to pay for a safe crossing. The report on options is due next week. Bonin believes it will contain an answer to the Centinella Crossing issue. The issue is important not just because of a crossing, but because of the message it sends if the Expo Bike Path, which has a Star Wars budget, comes out looking like Dude Where’s My Car. One of the best signs that Los Angeles is mentally ready for a truly multi-modal transportation system is the physical representation of the pent-up demand for bicycling infrastructure known as CicLAvia. When CicLAvia came to the Westside in April, Bonin was away on a long-overdue family vacation following the election. But that doesn’t mean he didn’t hear hundreds of reports, on Twitter, Facebook and face to face. But what struck him wasn’t the amount of people that experienced the CicLAvia VI: CicLAvia to the Sea, but how many didn’t. “I was surprised how many people, including active community leaders, didn’t know about CicLAvia,” Bonin said. This was an experience I shared, finding myself explaining to puzzled parents at my son’s preschool why Venice Boulevard was “closed yesterday” and why Sammy was so suntanned. Clearly, we have some work to do for next year. But, as is true for many Livable Streets believers, Bonin finds CicLAvia to be a game-changing event for the city. “Three of four CicLAvias ago, it really struck me that this was the Los Angeles of my imagination,” Bonin says. He’s not just of the experience of bicycling with a couple hundred thousand of his closest friends, but of the thousands of other little experiences and interactions an Angeleno can experience at CicLAvia. A similar experience can be found on the bus. Given the relatively non-bruising nature of the campaign to replace Bill Rosendahl, Bonin actually hired former rival Freddy Sutton as constituent advocate in one of his field offices, Bonin doesn’t have the celebrity of some of his colleagues in other districts. So, we road the bus in relative anonymity, except for one rider who did come over to say hi and engage in a minute of conversation. But as his time in office grows, he can expect to spend more time on the bus in unscheduled office hours and less answering email or scoping out the new raw food restaurant in Downtown Los Angeles. Bonin admitted, despite being in the middle of a cleanse in his second week in office, that he didn’t feel up to a bike commute downtown. However, if he’s looking for a little more privacy on his commute, he can always bike commute to his district office. I’m happy to hear Mike hired Fred Sutton… Fred was a good candidate but a bit light on experience. I’m also very encouraged that the Mayor appointed Mike and Krekorian to the Metro Board. Some of us remember the tone-deafness Metro exhibited 2 years ago when it insisted on studying Van Nuys and Sepulveda corridors transit options separately despite the obvious advantages (greater likelihood of Federal funding due to off the chart ridership potential) of studying them together. There was near unanimous support from transit advocates and public comments to request a combined study that may result in a rail line from Sylmar to LAX. But Metro choose internal expediency over logic and public sentiments. I was happy to hear Freddy was brought on as well. He’s got a great future and was running for the right reasons. It will be interesting to see if Mike mentors him for a future run for another office or let’s him learn the ropes by himself.